More than a decade into his NBA career, Gasol was traded for the first time when the Raptors acquired him in a blockbuster deal at Thursday's NBA trade deadline. The player affectionately known as "Big Spain" said suiting up for team with lofty post-season aspirations, plus a Spanish connection, eased his transition. f Marc Gasol had any lingering sadness about leaving the only NBA team he'd ever known, Toronto's fans made the newcomer feel welcome on Monday. 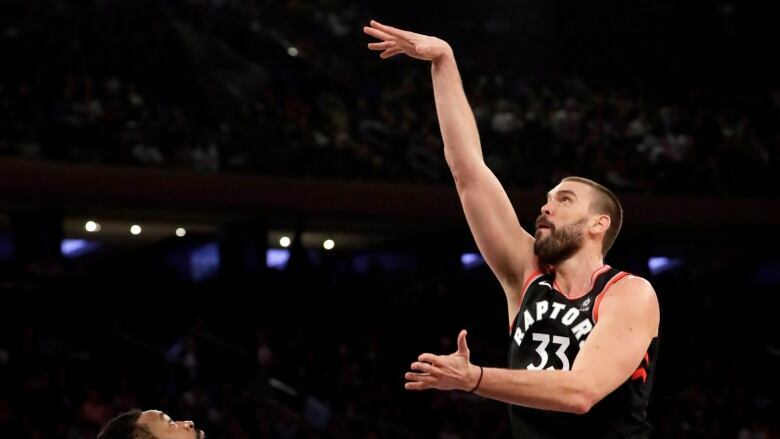 The player affectionately known as "Big Spain" received a standing ovation at Scotiabank Arena when he entered the Raptors' game against the visiting Brooklyn Nets with 3:03 left in the first quarter. The 34-year-old, who'd lived in Memphis since he was 16 and had been a Grizzlie for the past 11 seasons, was traded for the first time last week when the Raptors acquired him in a blockbuster deal at Thursday's NBA trade deadline. Gasol said the team's lofty post-season aspirations, plus the team's Spanish connection, eased his transition. "[It's] the sole goal of winning. There's no doubt, there's no hesitation, we're here to win, and how you contribute to that, it's what's important," Gasol said through a wide smile. "So that makes things a lot easier because at the end of the day that's the answer that you're going to get." Toronto Raptors president Masai Ujiri hasn't been shy about assembling pieces for a championship run, jettisoning a third of the team's roster, including Lithuanian centre Jonas Valanciunas, ahead of the trade deadline. And ESPN reported Monday afternoon that sharpshooter Jeremy Lin, who scorched the Raptors with a buzzer-beating three in rookie season, is en route to Toronto. "We were playing in New York and you could already feel that energy," Gasol said. "It felt like there were thousands [of Raptors fans] up there. Imagine having all of them here. It's exciting. You feel happy. And what you're playing for, it's exciting as well." While Gasol, who scored his first basket at 10:27 in the second quarter, came off the bench Monday, that spot isn't set in stone in coach Nick Nurse's fluid rotation. "It's not as emotional probably. You're older. You're more mature," he said. "You put things into perspective. You understand the chance you have coming from a team that hasn't made the playoffs last year and more likely than not this year as well, having a chance to be back [in the post-season], you know how much it means.